A street-smart investor in his professional life, Mike Trace had it all. He'd built an empire from nothing, played the game and come out ahead. But when one of his business decisions resulted in the loss of innocent life, Trace had a moment of clarity. Realizing that his wealth made him nearly untouchable and therefore above suspicion in such matters, he adopted the mantle of the Foolkiller and set out to punish his former peers for their own negligent crimes. When he's finished dispensing his own form of justice, Mike decorates the scene with his own brand of calling card – the tarot of the fool. Gregg Hurwitz has made no secret of his intentions here: he wanted to write a gritty crime thriller within Marvel's MAX imprint, but Garth Ennis had the regular gig on The Punisher. 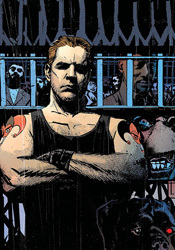 So it should come as no surprise that Hurwitz's Foolkiller is basically Frank Castle, Jr. Sure, each character has their own little ticks, things that set them apart from one another, but at the very core they're strikingly similar. Both see corruption in everything and set out to remedy it the only way they know how – mass murder, justice of the eye-for-an-eye variety. In more ways than one, Foolkiller accomplishes what it sets out to do. The seedy, grimy criminal atmosphere that pours out of most issues of Punisher MAX has been replicated authentically. While the Punisher generally stomps his way through New York, the streets of L.A. referenced in these pages are every bit the mirror image of their cousins in the Big Apple. Sadly, the story's setting is a more interesting character than the men and women who run around inside of it. Where Frank Castle has a wordless sort of charm and charisma, Mike Trace has nothing of the sort. As a personality he's paper-thin and uninteresting, just another grim face in an ocean of look-alikes, and his supporting cast is generally in the same boat. This plot shows a lot of promise, but without an engaging character or two to push it along, it loses its luster rather quickly. Hurwitz has the mood right and shows a willingness to push the envelope, but can't quite engage his readers like he should. The new series benefits tremendously from the artistic contributions of Paul Azaceta, whose heavy, deliberate lines give the book an instant dramatic face. His thick, moody blocks of shadow provide just enough detail to remain legible, and paint each page with the kind of ambiance usually reserved for hardboiled crime fiction. He shows restraint when necessary, pulling back from an artist's natural tendency to over-render a page in that constant search for a perfect balance between simplicity and detail. His characters display vibrant personalities, even though they're never fully explored by the storytelling. Azaceta's artwork is largely responsible for most of the issue's successes, and Hurwitz couldn't have asked for a better partner for the story he wants to tell. In its second mini-series, Foolkiller shows a lot of promise but doesn't always follow through. Its astoundingly rich environment is wasted on a meager cast and a pale impersonation of another story's protagonist. This isn't an unbridled success, but it isn't an outright failure, either. Flip through it for the exceptional artwork and strong scenery... they're the real stars of this show. i dont know...i like the immediacy of the story but agree I could use a little more character depth. I believe it is ready to be fleshed out. I think the vigilante artist concept is very unique and adds colour versus a black and white vision (castle) enough to keep me very interested - I'm maxed on the punisher and welcome this character and story.